Practice for the 78th running of the 24 Hours of Le Mans takes place this week. 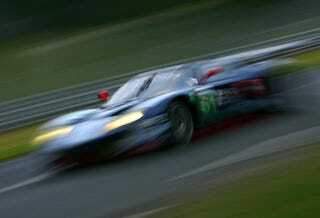 200-mph racing cars set loose in the French countryside? Ford GT? Aw heck, mes amis, you had us at bonjour. The #61 Matech Competition Ford GT, driven by the all female team of Natacha Gachgang, Rahal Frey and Cynde Alleman of Switzerland. Old shape, old colors, old track, still excellent. Click here to see all of the photos on one page. Thomas Erdos of England drives the # 25 RML Lola leading Franck Montagny of France driving the # 2 Team Peugeot Total Peugeot 908. Public roads, people. Le Mans is the name of a town; a good chunk of the race's competition surface, including the hallowed, 200-plus-mph Mulsanne Straight, is composed of closed-off public highways. (Note the backwards traffic arrows in this shot.) Nuts. Nigel Mansell, former Formula 1 champion and driver of the # 5 Beechdean Mansell Ginetta Zytek prototype, chats in the pits. Those eyes speak volumes. David Brabham of Australia jumps from the #26 Highcroft Racing HPD ARX1 during pitstop practice. Track workers line up and wave the green flag to the course car before practice to indicate the track is ready to go hot. Benoit Treluyer of France drives the #8 Audi Sport Team Joest Audi R15. The #4 Team Oreca Matmut Peugeot 908 driven by Olivier Panis, Nicolas Lapierre and Loic Duval. Legendary BMW Motorsport director Mario Theissen sitting in the pits during practice. Mustaches, determination, big headsets: German racing in a nutshell. Allan McNish of Britain drives the #7 Audi Sport Team Joest Audi R15 under the track's iconic Dunlop pedestrian bridge.